Why Are We SUFFERING? Were We Just ACCIDENTS Waiting to Happen? So you can see we’re dealing with this grand convergence of two mighty forces. And when the combo exceeds our personal threshold, the accident waiting to happen – happens. I remember it like it was yesterday. I was 20-years-old and starting my junior year at college. Even though I’d had hints throughout the year before, my panic disorder with agoraphobia constellation of symptoms caused me to tumble downward as though I was running on hundreds of banana peels. And I had no idea what hit me, much less what to do about it. The very sad – wasteful – thing is, I wasn’t fully assessed, diagnosed, and treated until 14 years later. Yikes! I’ve never had issues with self-disclosure, so doing the math, I’ve had 42 years to ponder why I suffer. And, yes, I kick it around to this very day. With that onboard, the DSM proposes that predispositional vulnerabilities (diatheses) combine with stress from life experiences to generate, in our case, mood or anxiety glitches. Okay, those predispositional vulnerabilities. Let’s go with genetic, psychological, biological, and/or situational factors. Life experiences? They can range from minor misunderstandings to full-blown trauma, throughout the lifespan. Let’s work through a very simple example. Melissa and Brian (not related) both have a family history of depression. That automatically makes them more likely to present with variations of the disorder. Melissa had a very stable childhood and adolescence environment, and maintains a nurturing social network as an adult. Her self-esteem is really strong. Brian, on the other hand, was emotionally abused as a child and teen, and as an adult, pretty much stays to himself. The DSM would submit that Brian has a much greater chance of developing a depressive disorder than Melissa, even though diathesis is at play in both. Now, it’s really important to understand the DSM allows for “protective factors.” Fact is, Melissa’s nurturing social network and strong self-esteem counteract the force of any life stressors she may have experienced, thereby curbing – perhaps preventing – the presentation of her predispositional vulnerabilities. That’s hope, by the way. The DSM fits perfectly with how I’ve come to understand the origin and development of my emotional/mental challenges. There’s no doubt in my mind that diathesis looms large in my disorder presentation. Genetics, psychological, biological, and who knows what else – I know they’ve been there from (minus) day one. And then you add a very unsettled childhood and adolescence experience and boom. In my case, say hello to a powerful anxiety disorder. But in spite of what may be considered my “misfortune,” at least being able to attribute the whole mess to the DSM knocks-out so much self-blame, shame, and defame. You know, it just isn’t my fault, though I’m still responsible for management. So what about you? 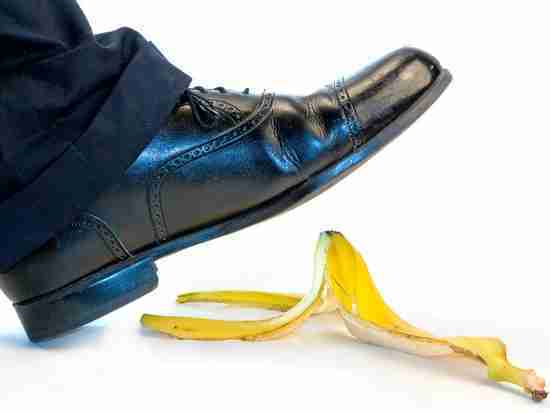 Given the diathesis-stress model, can you fit the pieces together in an effort to understand and embrace your banana peel tumble? How come the why’s of it all still matter to me? Hmmm. Well I suppose it’s a continuation of where I went in my head when I first “peeled-out” all those years ago. And making all the sense I can out of it has always provided comfort. I mean, it’s one thing feeling horrible, but it’s quite another not knowing why. Again, how is it with you? Were you just an accident waiting to happen? Inviting you to access hundreds of Chipur mood and anxiety disorder articles. Next Post: Cognitive DISSONANCE: For a good shot at FEELING BETTER, read this. Previous Post: The NEUROGENESIS Theory of DEPRESSION: Have We Reached the Promised Land?